Before he was the villain, he was a real-life hero with the Royal Air Force during World War II. 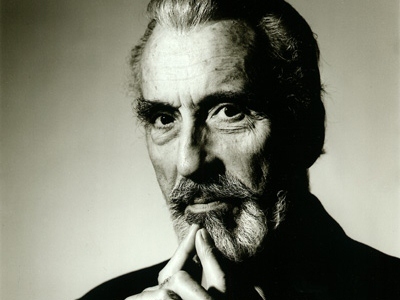 Sir Christopher Frank Caradini Lee, CBE, CStJ was born on May 27, 1922. His mother was a well-known Edwardian beauty and his father, Geoffrey Trollope Lee, was a Lieutenant-Colonel in the 60th King’s Royal Rifle Corps. Lee volunteered in 1939 to fight for the Finnish forces during the Winter War against the Soviet Union. He was, however, issued winter gear and was posted on guard duty but was kept at a safe distance from the Russians. According to Lee’s autobiography, he and his fellow Brits were only in Finland for two weeks and never saw the Russian forces. In 1941, Lee enlisted with the Royal Air Force to serve in World War II. After eye problems forced Lee to drop out of training in South Africa, he ended up in North Africa as a Cipher Officer. He spent the remainder of the war working in intelligence, including his work as an Intelligence Officer with the Long Range Desert Group. Lee ended up in the Special Operations Executive (SOE), a special forces unit whose missions dealt with espionage and sabotage behind enemy lines. Being a member of the, also known as The Baker Street Irregulars, Churchill’s Secret Army, and The Ministry of Ungentlemanly Warfare, suggests pretty strongly that Lee worked as a spy. When World War II drew to a close, Lee retired from the military, having achieved the rank of Flight Lieutenant. He then joined the Rank Organization where he trained as an actor. Film roles followed, and the rest, as they say, is mustache-twirling history.